Of course, next month is the next to last show of the year and an excellent opportunity for finding that special gift for people on your list or even for yourself. Visit the show to buy, sell, trade or browse among the many different numismatic and other collectibles on display. Join us on Sunday, November 12, 2017, for the next Greater Atlanta Coin Show. The October 2017 Greater Atlanta Coin Show welcomed visitors to a busy bourse in a busy hotel. Last month, hurricane Irma impacted the area. This month the threat of Tropical Storm Nate was prevalent in the news. But, a rainy, low 70s day did not keep our visitors away. Yes, the morning started out a little slow, but then the bourse became busy by mid-morning. To our many visitors - whether you are new or returning, local or visiting the area, avid numismatist or someone just curious- we appreciate all of you, and we hope you enjoyed the dealers' many displays. To our many dealers - whether you are a recurring or new dealer -we also appreciate you along with our security and the hotel's staff for keeping the show fun and busy each month. This month, due to the busy hotel, the coin show was down one level in the Lyon, Sanford and Cole rooms. Visitors easily moved among the displays in each of the rooms. So, why was the hotel so busy? Well, they had at least five different weddings and a bar mitzvah. One of the weddings was a Muslim affair and another was an Indian event. Not sure about the other three, and they could have had more as busy as the hotel seemed. Outside, parking near the entrance was a challenge due to several mobile buildings, and these were buildings, not small by any means. Let's take a tour of some coins and exonumia for this month. With the current gold and silver markets, people visiting the coin show frequently look for the different bullion coins from American eagles to Canadian maples to Chinese pandas to other countries and varieties. Many people think of one ounce coins, but other sizes are available as well. 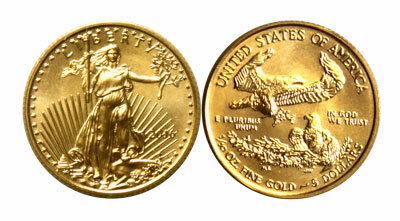 In 1986, the US Mint began producing American Eagle bullion coins. In gold, they struck .10, .25, .50 and 1.00 ounce coins for face value of $5, $10, $25 and $50 respectively. 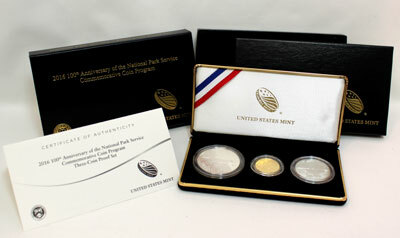 Depending on the year, the US Mint produced uncirculated, proof, reverse proof and burnished versions of the coins. The uncirculated gold bullion coins are distributed through the authorized dealer network. The other types of coins can be obtained directly from the US Mint. 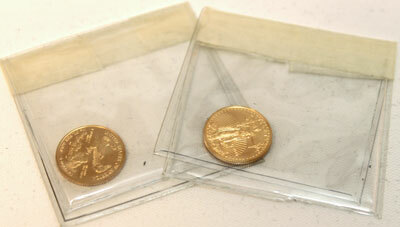 These two small coins are both uncirculated American Gold Eagles one-tenth ounce or $5 coins. Normally, these coins can be found in protective holders, however these two, for whatever reason, were placed in 2x2 flips, still protective, but not as much so. People may prefer them in the OGP (original government packaging), however their value is in their gold content not in the packaging. The design of the gold eagle, regardless of size and denomination, remains the same with Liberty by Augustus Saint-Gaudens on the front and a family of eagles by Miley Busiek on the back. Beautiful coins even though they seem almost weightless. 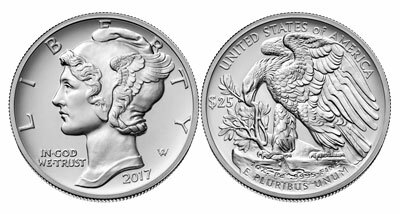 In keeping with the eagle theme and the interest in palladium in the bullion metals market, the US Mint released the 2017 American Eagle Palladium Coin on September 25. No, we looked, but the coin didn't make it to the October bourse, hopefully someone will have the coins available at the November coin show. Somewhat oddly, this coin was approved by Congress in December 2010 in Public Law 111-103, but the Mint is just now delivering the coins. The Secretary shall acquire bullion for the palladium coins issued under this subsection by purchase of palladium mined from natural deposits in the United States, or in a territory or possession of the United States, within 1 year after the month in which the ore from which it is derived was mined. If no such palladium is available or if it is not economically feasible to obtain such palladium, the Secretary may obtain palladium for the palladium coins from other available sources. ‘‘(C) the coin shall bear such other inscriptions, including ‘Liberty’, ‘In God We Trust’, ‘United States of America’, the denomination and weight of the coin and the fineness of the metal, as the Secretary determines to be appropriate and in keeping with the original design. The US Mint's production of the 100th anniversary of the Mercury dime in gold last year followed by the same obverse design in palladium this year seems curious. Of course the reverse designs differ, and the weight and metals make the size different as well. The gold Mercury dime contained .10 ounce of .9999 fine 24-karat gold. Congress specified one troy ounce of .9995 of fine palladium to be in the American Eagle Palladium bullion coin for a face value of $25. These images compare the designs of the two coins - gold versus palladium. 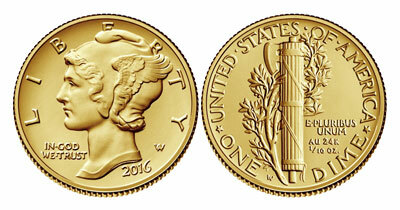 The Mint specified the gold Mercury dime as 16.50 mm (0.65 inch). Another web site lists the specifications for the palladium coin at 34 mm (1.34 inches). Both coins provide beautiful examples of Adolph A. Weinman's designs. Next on our tour is a three-coin set, the 2016 National Park Commemorative silver dollar, cupro-nickel half dollar and gold five-dollar proof coins. 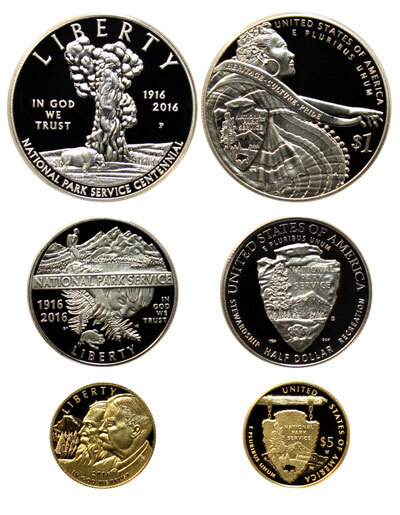 In March 2017, the US Mint announced: "Public Law 113-291 authorizes the United States Mint to mint and issue 100,000 $5 gold coins, 500,000 silver dollar coins, and 750,000 half dollar clad coins to commemorate the centennial of the National Park Service (NPS). The coins will be available in both proof and uncirculated qualities." To date, the US Mint's production numbers show they sold 14,950 of the three coin sets; 4,916 of the proof and 5,150 of the uncirculated gold coins; 62,719 proof and 20,994 uncirculated silver coins; and 40,254 proof and 21,019 uncirculated clad coins. Half Dollar obverse: Features a hiker discovering the majesty of the wilderness and a small child discovering a frog hiding in ferns, celebrating the diversity and breadth of the National Park Service. Half Dollar reverse: Features the National Park Service logo. Silver Dollar obverse: Features Yellowstone National Park's Old Faithful geyser and a bison. Silver Dollar reverse: Depicts a Latina Folklórico dancer and the National Park Service logo, representing the multi-faceted cultural experience found in America's national parks. Gold Five-Dollar obverse: Features John Muir and Theodore Roosevelt with Yosemite National Park's Half Dome in the background. Gold Five-Dollar reverse: Features the National Park Service logo. Congress approved these coins in Public Law 113-291 on December 19, 2014. They stated, "all surcharges which are received by the Secretary from the sale of coins issued under this section shall be promptly paid by the Secretary to the National Park Foundation for projects and programs that help preserve and protect resources under the stewardship of the National Park Service and promote public enjoyment and appreciation of those resources." 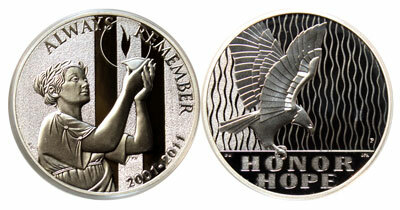 These three coins provide beautiful examples in remembrance of the National Park Service. The tour continues, but this time it is a medal rather than a coin produced by the US Mint. The National September 11 Memorial & Museum Commemorative Medal Act of 2010 authorizes the striking of silver medals in commemoration of the 10th anniversary of the September 11, 2001, terrorist attacks on the U.S. and the establishment of the National September 11 Memorial & Museum at the World Trade Center. Signed by President Obama on August 6, 2010, the act requires the Secretary of the Treasury to strike and offer for sale up to 2 million one-ounce silver 2011 September 11 National Medals. The medal’s designs are emblematic of the courage, sacrifice and strength of those individuals who perished in the terrorist attacks; the bravery of those who risked their lives to save others that day; and the endurance, resilience and hope of those who survived. 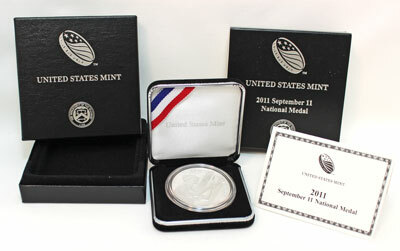 The United States Mint certifies that this medal is a genuine 2011 September 11 National Medal, struck and made available for sale in accordance with legislation passed by Congress and signed by the President on August 6, 2010, as Public Law 111-221. This medal was struck by the Department of the Treasury, United States Mint in commemoration of the 10th anniversary of the September 11, 2001, terrorist attacks on the United States and the establishment of the National September 11 Memorial and Museum in the World Trade Center. Obverse: Features Lady Liberty holding the Lamp of Remembrance. Behind her are beacons of light stretching skyward. Liberty, the lamp and the light symbolize not just the immeasurable loss on that fateful day, but also the resiliency and triumph of those who persevered. Inscriptions are ALWAYS REMEMBER and 2001-2011. Reverse: Depicts an eagle, symbolizing the strength of the survivors, families and Nation, against a backdrop of cascading water. The flowing water is emblematic of peace, serenity, healing and the continuity of life. Inscriptions are HONOR and Hope. The medal contains one troy ounce of silver and provides a beautiful reminder to never forget 9/11/2001. Last on our tour for this month is what is known as a silver art round. Produced by a medallic arts facility rather than the US Mint, the silver round still provides a beautiful example of an anniversary. This medal commemorated the centennial anniversary of the dedication of the Statue of Liberty in 1986 and also recognized the contributions of Ellis Island as the famous immigration point for millions of people. Ellis Island closed its immigration facilities in 1954 and became part of the Statue of Liberty Monument in 1965. The obverse shows the Statue of Liberty, flanked by the dual dates 1886 and 1986. the word LIBERTY arcs across the top of the round, and ELLIS ISLAND along the bottom. 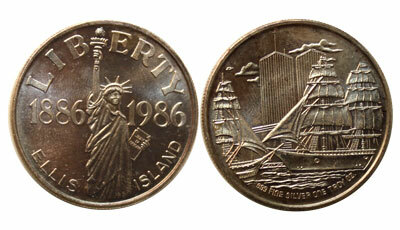 The reverse has a scene of sailing ships in front of the shore of Manhattan, the twin towers of the World Trade Center show in the background. Also, as shown on the reverse, this art round is one ounce of .999 fine silver. Not only does this art round remember the Statue of Liberty's centennial, it also provides a remembrance of the twin towers before they fell in 2001.